A few weeks back my wife and I celebrated our second anniversary, this also happened to be the same day that I sprained my knee, so you can imagine there wasn’t exactly a whole lot of celebrating that evening. Our dinner plans were obviously put off for the evening, so we decided that our dinner at Kouzzina in early November would be our special way of celebrating, if belated. Cat Cora’s latest creations were certainly up to the task of carrying the burden of the celebration. 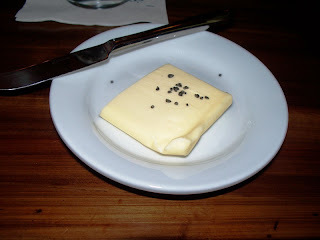 The dinner began with a five grain bread served alongside Hawaiian black sea salt topped butter. 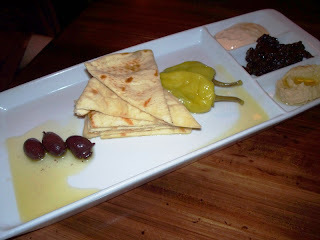 We also opted for to try to Kouzzina Spreads. Served alongside grilled pita, rosemary infused olive oil, and three kalamata olives the spreads included kalamata fig, chickpea hummus, and harissa yogurt. The play between the sweet and salty components of the kalamata fig spread paired well against the spicier elements in the harissa yogurt, while the hummus was definitely in upper range of the varieties of hummus I have tasted. For the cocktail portion of our meal my wife sampled the Alfa Lager from Athens while I partook of Cat Cora’s signature drink the Ouzo-tini. 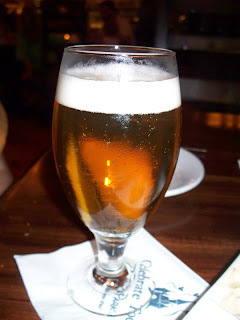 The Alfa Lager was lighter than most lagers, but fuller than a vast majority of American lagers. With a less hoppy flavor, the Alfa Lager was a smooth compliment to the meal. Meanwhile, the Cat’s Ouzo-tini, made with Metaxa Ouzo, vodka, lime and pineapple juices, pomegranate, and a sugar rimmed glass is made for ouzo and licorice lovers. 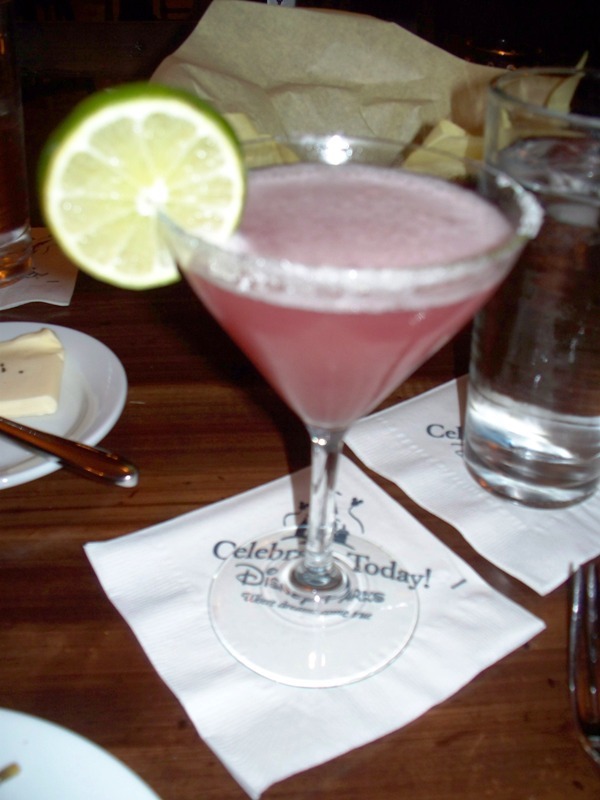 With just a hint of citrus tang, the Ouzo-tini could easily be mistaken for a high quality black licorice jelly bean. To my appetite, this was an excellent cocktail, but is understandably not for every palate. My wife’s main course was the Char-grilled Lamb Burger served alongside sweet potato fries. 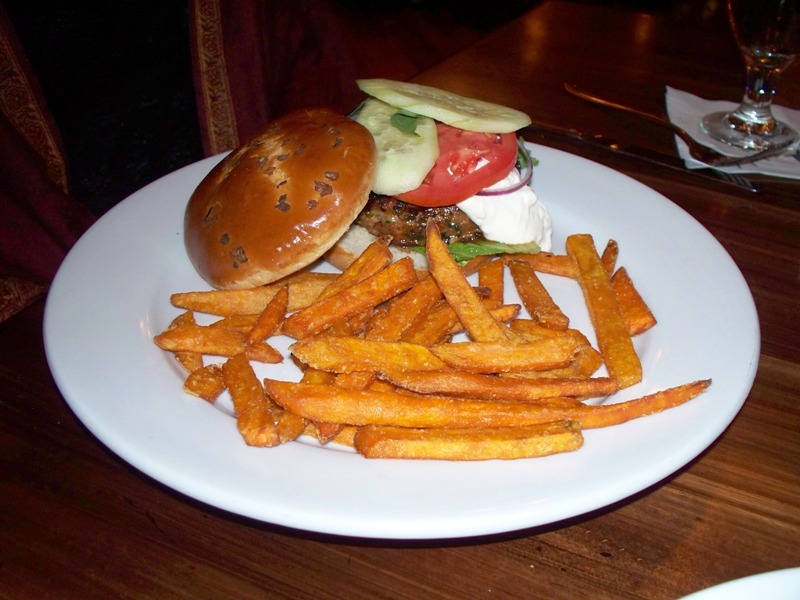 It is tough to justify $15.99 for any hamburger, but Kouzzina’s creation raises the bar far beyond expectations. A tender portion of lamb, infused with the harissa yogurt, olives, and other herbs and spices, is served atop a semi sweet roll. Include a generous portion of feta cheese sauce, tomatoes, purple onions, and cucumbers, and this is one hamburger that is not soon to be forgotten. To add to the complex structure of this simple meal, regular French fries are swapped for a sweet potato variety which pairs better with the flavors of the lamb. For my entrée I selected the Cinnamon Stewed Chicken. Dished up in a steaming bowl of herbed orzo, Mazithra cheese, and tomatoes, this meal is the comfort food of my childhood. While the specific ingredients may vary from my family’s heritage further along the Mediterranean, the ample pieces of stewed meats complete with the bone in, a starch component, and fresh vegetables is enough to warm if the chilliest of souls. 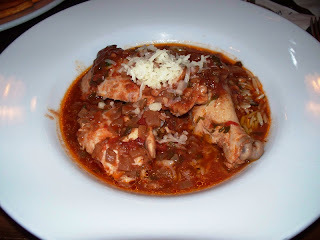 The portion size and heartiness of this dish is more than enough to fill any appetite. For dessert we decided upon the Loukoumades, freshly made Greek doughnuts drizzled with honey. 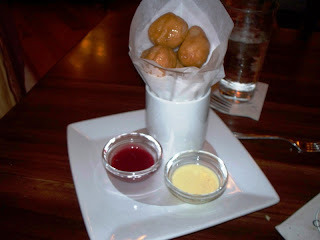 Accompanying the doughnuts were a vanilla and a raspberry sauce. While both sauces were sharp enough to contrast the sweet of the honey covered pastries they were, in fact, unnecessary. The lightly sweetened doughnuts, served warm, were a soft and satisfying end to the evening all on their own. The staff of Kouzzina should stand as tall as the food they serve. Over the course of our two hours in the restaurant we witnessed several occasions of taking the extra time to make a meal more memorable. From a chef speaking with guests about dietary needs and then checking back during the meal to make sure the outcome was agreeable, to celebrating celebrations, and getting to know each and every diner, the staff worked in remarkable ways. 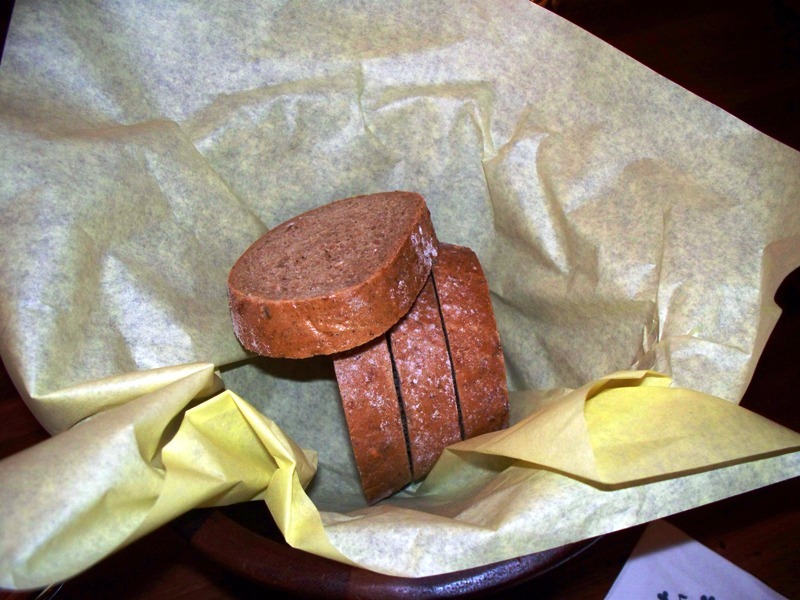 Our server, Lyzbeth, who was working on her husband’s birthday, made sure that both my wife and I were happy with each course, dishing out cautions and recommendations with an easy manner. If the food alone hadn’t made the night enjoyable, Lyzbeth went above and beyond in her service to do so. If there was a drawback to the evening, and it is hard to find a flaw in the fog of affability created at Kouzzina that night, it is the same snag suffered by its predecessor, Spoodles. Given the large open kitchen and high-ceilinged dining hall the noise level during peak hours does seem to reach a fevered pitch. Though if this is only due to the fact that patrons are having as wonderful of a dining experience as my wife and I did, then the volume is to be expected. Kouzzina is Greek for kitchen, and throughout my life the kitchen has been a warm spot in the house where wonderful aromas and flavors are matched perfectly to the smiling hearts and boisterous conversations of family. 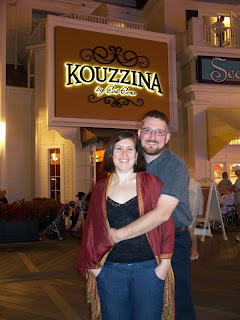 Cat Cora’s Kouzzina, found along Disney’s BoardWalk, encompasses those same traits that have always made my family’s kitchens so welcoming. I am confident that this first bite into this expansive menu will not be my last. what a wonderful review! thanks for sharing this...my husband and i are thinking about eating here in January...and now I think I'm sold! Nice review! I was thinking of brunch here after the marathon in January, but I can't find any info on their breakfast hours. The breakfast entrees sound amazing. Thanks for this review. I have a ressie for over Christmas and am now sure it will be wonderful. Great review -- I've been looking forward to it. I'm so glad you guys had such a wonderful Anniversary celebration. The burger looks great! Great review! I might head over there the next time I'm at Walt Disney World. I'm a fussy eater, but the burger looks lovely and I would just have to try a cocktail! Belated congratulations to you and Aileen for your second anniversary!